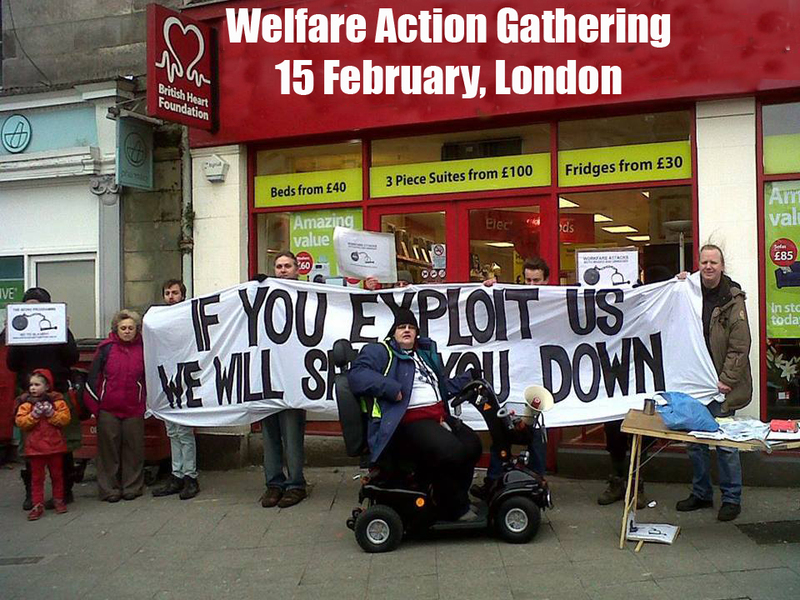 Come to the Welfare Action Gathering on 15th February! Getting your rights on Job Seekers Allowance is about a lot more than just knowing your rights. This workshops aims to highlight some of the key rights, but also share some of the tactics groups and individuals have used to avoid getting screwed at the Jobcentre. Hear from campaigns that have been organising around the bedroom tax and benefit cap in their local communities, find out how to set up an eviction resistance network, learn about our basic housing rights, and discuss how we can push for quality, secure, and truly affordable housing for all. Support, solidarity and resistance, understanding and negotiating on bills and debt, and more on Fuel Poverty Action’s pre-payment meters campaign. Learn together how we can effectively navigate our way around Employment and Support Allowance for those claiming and those wanting to provide support. This will cover how to start a claim for ESA, methods of attempting to avoid Atos, and how to support each other through Atos to ensure we get the benefits that are rightfully ours. Bringing workfare down – Tens of organisations have pulled out of workfare and the government fears the schemes’ ‘collapse’. A chance for us to explore great ideas or important questions people have brought to the day, and link up to make things happen! 120 people were sent on Mandatory Work Activity Placements for Scarborough Borough Council, but the scheme has now been cancelled! Less than two weeks into 2014 and we’re already having an impact! Scarborough Council, one of the worst workfare-using councils in the UK, has cancelled its involvement. Volunteer centre Knowsley CVS has taken the principled stand to have nothing to do with workfare schemes. On Friday, the DWP’s social media strategists were forced to abandon use of their hashtag #takeoverday to promote ‘work experience’ when people literally took it over to campaign against sanctions and workfare! Over Christmas, The Mirror and The Guardian published our research into UK councils using workfare. Scandalously, councils have benefited from at least half a million hours of workfare labour since 2011. We highlighted some particularly shocking examples, including Scarborough Borough Council, which had taken 120 Mandatory Work Activity placements in its Parks Department. In December’s week of action, Edinburgh Coalition Against Poverty shut the Salvation Army shop down for over two hours! The workfare industry annual conference disrupted with a very loud noise demo. Salvation Army in Edinburgh – the main users of Mandatory Work Activity in the city – blockaded for two hours. An anti-sanctions action in Germany. Solidarity with claimants subject to the farcical pilot of Universal Credit. The petition for all sanctions to be scrapped hit 10,000 signatures. Tea and information outside job centres. Workfare users picketed in Wales, Scotland and England. All this in just one week in 2013 – a year in which ordinary people made workfare’s progress a whole lot more rocky. In 2013, your actions online and on the streets meant these brands stepped back from workfare: Shoe Zone, The Red Cross, Capability Scotland, Marriott Hotels, Superdrug, Argos, Wetherspoons and Debenhams. In April, we helped expose that at least one Homebase store was using 25 placements at a time to save hundreds of hours on their payroll, and cutting existing workers’ hours as a result. Thousands of people took action online and outside Homebase stores across the UK, and just one month later, the company withdrew from the scheme (though we’re chasing up reports that it’s since reappeared in their Willesden store). New research by Boycott Workfare, covered in The Mirror and The Guardian, reveals that UK councils have used over half a million hours of unpaid work through the government’s workfare schemes, which compel people to work without pay on threat of benefit sanctions. Click here to see if your council is involved! In a Freedom of Information request to all councils in the UK, 62% of the 271 councils who responded and held the information had taken a workfare placement at some point in the last two years. These placements include schemes with direct benefit losses, benefit losses if you drop out after starting, or referral to a scheme with direct benefit losses if you refuse to take part. Also, with all these schemes, Boycott Workfare has heard of people being told it is compulsory by their job centre advisor, even if officially you can choose to take part. In total 1,929 placements were reported to have taken place across the 167 councils involved since June 2011, with 15 councils reporting use of the schemes but not saying how many placements they had taken. This is over 500,000 hours of unpaid work. Half of these reported placements were on the Work Experience scheme, but nearly 300 placements were on Mandatory Work Activity where people can receive a benefit sanction for up to 3 years for refusing to take part in the 4 week placements. Almost 300 people were also sent to work at councils through the Work Programme (or Northern Ireland’s equivalent Steps to Work) where placements were lasting up to 26 weeks. This entry was posted in Campaigns and tagged Employment support allowance, Job seekers Allowance, Welfare Action Gathering, Work Capability Assessment, Work fare, work programme by tamesidegreens. Bookmark the permalink.